The Rive Gauche Restaurant and Bar at the Baur au Lac in Zurich, Switzerland deftly combines the old and the new with architectural elements from 1844 blending gracefully with the modern that is in perfect harmony with the cuisine of talented Chef Olivier Rais. After enjoying aperitifs of champagne in the comfortable wood-paneled Le Hall, Edward and I progressed to the Rive Gauche Restaurant and Bar, where the culinary focus is Mediterranean Grill. The ambience is one of casual elegance; cream leather chairs and banquettes flank dark wood tables that feature woven placemats and white linen napkins and are accessorized with votive candles, arched ornate dark wood catches the eye over the deeply recessed windows, contemporary lamps with cream shades hang over the tables throughout the dining room to softly illuminate, and a long rectangular light box on the back wall of the dining room changes color throughout the evening softly casting a soft violet, blue, pink, and green glow to the room. 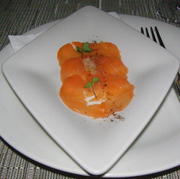 Chef Olivier Rais began our evening by sending us Tuned Salmon, (Marinierter Lachs auf Gurkencarpaccio, Thunfischtatar), which was Marinated Salmon on Cucumber Carpaccio and Tuna Tartar. Paired with a 2007 Dézaley Chemin de Fer Grand Cru, Luc Massy, Lavaux, Switzerland, and accompanied by warm breadsticks, it was a delightful beginning to an evening of adventure. It was asparagus season, and in Europe, this is a season that is highly celebrated, with the elusive white asparagus, a highly sought after prize, and a prominent feature on the menu. 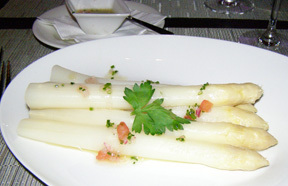 Edward continued with a plate of steamed white asparagus simply served with vinaigrette. The asparagus were the largest that we had ever seen and we wondered how tender the asparagus would be when they resembled trunks of small trees. One bite confirmed that they were indeed tender with its distinctive delicate flavor that is so unlike its green cousin. I had the O Tempura, O Morels (Spargelcremesuppe mit Morcheln), a rich and creamy Asparagus Cream Soup with Morels and a crisp rosette in the center, that Michael, our attentive server, who resembled the actor Jason Bateman, poured tableside. 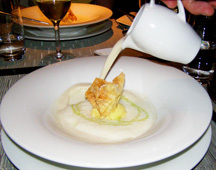 The soup was made with white asparagus that celebrated the season and its bounty. For his main course, Edward had the Big Bertha (Riesen - Kalbspaillard) which was a Giant Veal Paillard accompanied by Ratatouille. Thinly sliced and pounded, the generous portion of veal was grilled and rolled, and accompanied with a bowl of herb butter to spread on the meat for additional flavor. The meat was so tender that it could almost be cut with a fork, and the ratatouille proved to be a lovely companion. I continued my asparagus festival with the Frere Jacques (Jakobsmuscheln mit Spargeln, Morcheln und Bärlauchvinaigrette), which was grilled Scallops with Asparagus, Morels, and Garlic Vinaigrette. Arriving bearing distinct grill marks, the four large seared scallops were attractively presented on a bed of chopped green asparagus with a generous portion of exotically meaty morels, garnished with tiny herbs, and herb oil and reduced balsamic streak painted on the dish. This was another gorgeous course that appealed to the eye as well as the palate. Michael paired our main courses with an aromatic 2006 Riflessi d'Epoca Merlot, Guido Brivio, Ticino, Switzerland, 13.2% alcohol, which nicely complemented both the veal and the scallops. 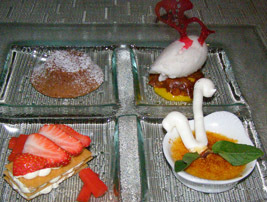 We ended the evening with a selection of desserts (Eine kleine Reise durch die Dessertkarte) a small journey through the dessert menu with Burnout (Gebrannte Crème aromatisiert mit Tahiti-Vanille) Crème Brûlée flavored with Tahitian Vanilla and garnished with a meringue swan and a mint leaves; Mango À Gogo (Karamellisiertes Mangotörchen und Lycheesorbet) Caramelized Mango Tartlet and Lychee Sorbet garnished with a flavored red sugar whimsy; Choco Plus C (Warmer Schokoladenkuchen) Warm Chocolate Cake; and Slip and Slide (Cremeschnitte und Granité von Erdbeeren und Rhabarbermousse) Cream Sliced and Iced Fruit of Strawberries and Rhubarb Mousse which was like a Napoleon with layers of flavors, which were attractively presented on an art glass plate. What we especially appreciated about the desserts were that they were the perfect tasting size so that we could share and enjoy each of them from the Crème Brûlée with its perfect caramelized crust, to the multi-textured and flavorful Mango À Gogo with its exotic lychee sorbet which was our hands-down favorite, to the decadent warm chocolate cake, to the light strawberry and cream Slip and Slide. Chef Olivier Rais, combined with Michael's attentive service, created a very memorable evening of dining for us at the Rive Gauche Restaurant and Bar. Following dinner, we progressed to the Rive Gauche Bar to soak up the ambience, which was bustling and clearly a Zurich hotspot, with its well-presented cocktail menu with an excellent selection of Martinis. 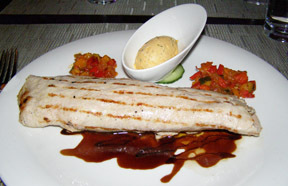 The Rive Gauche Restaurant and Bar is open from 11:30 am until 11:30 pm. Read other articles on the Baur au Lac and Rive Gauche Restaurant and Bar in the Hotels and Resorts section, and in the Chefs' Recipes (English, French, and German versions) section where Chef Olivier Rais shares his recipes for Tuna Tartar with Citrus Zest and Ginger, Red Wine Risotto with Radicchio, Simmental-Style Beef, Mediterranean Mélange of Vegetables, and Crème Brûlée. 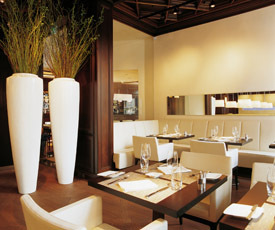 Read other articles on Zurich in the Destinations, Hotels and Resorts, Chefs' Recipes, and Travel News sections. Read other articles on Switzerland in the Destinations section: (Zurich), Bern, Interlaken, and Lucerne; Hotels and Resorts, Restaurants, Chefs' Recipes, Spas; in the Liquor Cabinet section: Swiss Vodka - The Art and Science, and Xellent Swiss Vodka, in the Wine Cellar section: Domaine Zweifel - The Art of Making Swiss Wine, and Lattenberg Rauschling 2005, in the Gastronomy section: 15th Annual St. Moritz Gourmet Festival, Emmental - The Art of Making Swiss Cheese, and Gastronomic Evening with Guest Chef Emmanuel Renaut, in the Luxury Products section: Confiserie Sprungli, and in the Adventures section: 24th Cartier Polo World Cup on Snow in St. Moritz, Skiing in St. Moritz, Switzerland, Snowshoeing in Arosa, Switzerland, Skiing in Arosa, Switzerland, Hiking Jungfraujoch, Switzerland, Hiking Mount Pilatus, Switzerland, Paragliding in Interlaken, Switzerland, and Porsche 911 Carrera S Driving Experience. For information on SWISS International Air Lines, please visit the website: www.swiss.com. For information on Switzerland, please visit the website: www.MySwitzerland.com. For information on Zurich, please visit the website: www.Zuerich.com. © May 2009. Luxury Experience. www.LuxuryExperience.com. All rights reserved.